The expended Saturn IVB stage as photographed from the Apollo 7 spacecraft during transposition and docking maneuvers. The round, white disc inside the open panels of the Saturn IVB is a simulated docking target similar to that used on the lunar module for docking during lunar missions. Apollo 7 was the first crewed spaceflight of the Apollo program that went into space. The crew of Wally Schirra, Don Eisele and Walter Cunningham spent nearly 11 days in space as they orbited Earth and tested out the command module spacecraft that was designed to bring humans safely to the moon and back again. By the time the mission launched on Oct. 11, 1968, NASA had worked hard at improving crew safety and heeded the concerns of astronauts that arose after a command module fire killed the Apollo 1 crew 20 months earlier during a routine launch pad test. But Apollo 7 proved to be an engineering success, despite crew illness and reports of tension between the space crew and ground crew. Commanding the Apollo 7 crew was Wally Schirra, a veteran of NASA's Mercury program, which was the first human spaceflight program at NASA. Schirra was the fifth American in space and flew a mission called Sigma 7 on Oct. 3, 1962, circling six times around the Earth. Schirra was also part of the Gemini program that had two crews of two people fly into space simultaneously. He commanded the Gemini 6 mission, which (along with Gemini 7) performed the first rendezvous between two manned spacecraft. Schirra was the only astronaut who flew in the Mercury, Gemini and Apollo programs. With Schirra were two spaceflight rookies. Walter Cunningham was a Navy pilot and previous to joining NASA, also worked on classified defense studies as a scientist for the Rand Corporation. Donn Eisele was an Air Force test pilot who previously worked on special weapons development. After the spacecraft had completed a couple of Earth orbits, Schirra turned the command module around to simulate a docking with the third stage of the Saturn IB rocket, called Saturn IVB. Future moon missions would require dockings between two spacecraft, called the command module and the lunar module, so the maneuver was important practice. The crew also extensively tested out the command module engine. This engine had to work flawlessly for the upcoming moon missions. It was designed to bring crews to the moon, slow the spacecraft down to enter lunar orbit, speed the spacecraft up to exit lunar orbit, and then position the crew for a safe re-entry back to Earth. While the mission in large part was a success, there were a few engineering glitches in the command module. The windows fogged, making visibility poor (but not impossible) for the astronauts inside. Also, there were minor problems in the electrical and fuel cell systems, and — in the crew's opinion — overly noisy cooling fans inside the cabin. All of these issues were noted so they could be fixed prior to future missions. The crew of the first manned Apollo space mission inside the White Room. From left to right, are Donn Eisele, Walter Schirra, and Walter Cunningham. An Apollo spacecraft was cramped quarters under the best of circumstances. On Apollo 7, the crew immediately learned of one of the drawbacks: it was very easy to catch an illness. In the microgravity environment of space, fluids don't drain as they do on Earth. This meant blocked ears and noses for the crew, who tried with little success to alleviate the symptoms by taking medication. The crew struggled to perform their tasks during the 11 days of space travel. Biographical accounts from astronauts and mission controllers affiliated with Apollo 7 said the crew was cranky when talking to ground controllers. But the description varies depending on who's telling the story. Just before re-entry, the crew elected not to wear their suit helmets; they were concerned about pressure hurting their ears as they arrived on Earth, and wanted the chance to blow their noses to relieve the pressure. This drew the ire of some at NASA. "It was insubordinate ... This crew shouldn't fly again," wrote flight director Christopher Kraft in his memoir, "Flight: My Life in Mission Control" (Dutton, 2001). In his own biography, "Schirra's Space," (Naval Institute Press, 2000) Schirra said the disagreements between flight crew and ground crew boiled down to one thing: "I was convinced that the men in Houston were overlooking certain intangible things," he wrote. While not elaborating on what those things were, he added that the crew had worked with the spacecraft for three years and knew its capabilities. 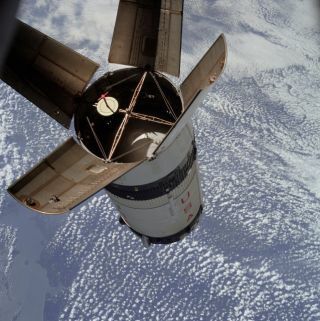 Conflict aside, the Apollo 7 mission was an engineering success. The program was ready to move on to the next phase: targeting the moon. The current location of the Apollo 7 spacecraft is at the Frontiers of Flight Museum in Dallas, where Cunningham was a long-standing board member. This year marks the 50th anniversary of Apollo 7. While Apollo 7 is not as well-remembered as other Apollo missions that reached the moon, it was an essential engineering test to prove the performance of the command module. NASA's next mission, Apollo 8, sent three astronauts in a command module directly to the moon for a lunar-orbiting mission. It was a daring mission that would have been far riskier without the Apollo 7 tests. NASA turned its attention to other priorities in the decades following, including the space shuttle program for Earth-orbiting science and satellite work (1981-2011), and the International Space Station program, where astronauts are sent on long-duration space missions in practice for future voyages to the moon and Mars. Meanwhile, multiple robotic missions to the moon in the past decade discovered extensive evidence of water, making it possible that future human colonies could use those resources. However, human missions to the moon may be on deck again soon. In late 2017, the Trump presidential administration directed NASA to return humans to the moon before going to Mars. NASA is also working on a lunar space station concept called the Deep Space Gateway and is testing out the Orion spacecraft for future lunar voyages.